The One I Love is a difficult film to write about without giving up its goods, but let's give it a shot here. A fantastical spin on the tired romantic comedy genre, first-time director Charlie McDowell's film... Dammit, "fantastical" is somewhat of a spoiler. OK, let's start over—beginning like many other rom-coms, The One I Love unfolds in ways that will make fans of Rod Serling and his timeless Twilight Zone series want to stand up and... Whoops, an even bigger failure to remain tight-lipped there. Hopefully, though, you're intrigued now. And if you are, here's the nutshell plot set-up for McDowell's funny, original, and refreshingly ambitious riff on a familiar kind of comedy movie. 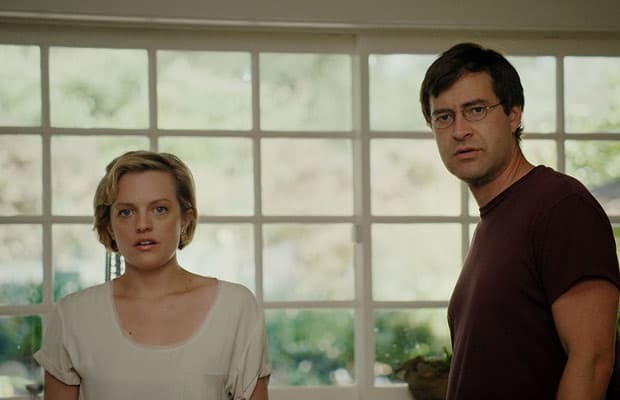 Ethan (Mark Duplass) and Sophie (Elisabeth Moss) are struggling to keep their marriage intact, so on the recommendation of their therapist (Ted Danson), they head to a secluded house surrounded by gorgeous scenery to have alone time and work through their problems. And from there, McDowell and screenwriter Justin Lader use creative means to grapple with love's inevitable twilight phase, when those once-burning flames fizzle out and complacency breeds contempt.